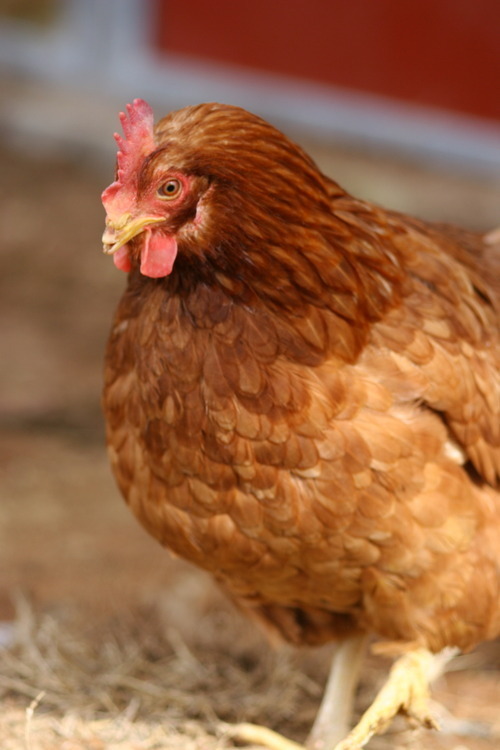 Emergency Turlock Hen Rescue Benefit Day – this Saturday, March 3! 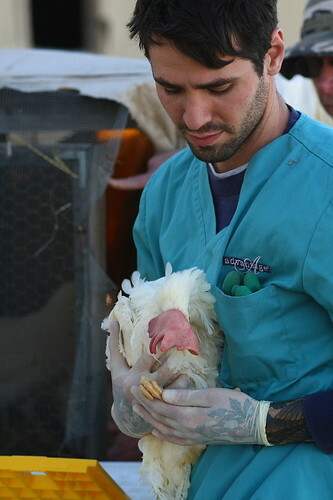 By now you might have heard about the massive rescue of thousands of chickens from an egg farm in Turlock, California. A few weeks ago, A&L Poultry decided to stop feeding the 50,000 “layer” hens at the facility, abandoning them to a slow death by starvation. When local animal rescue groups got wind of the situation, they stepped up to save as many hens as they could – but not before going up against local authorities, who were intent on killing the birds. While most of the hens perished, local rescue groups – led by Animal Place and Harvest Home Animal Sanctuary – were able to save more than 4,400 of these lovely ladies. Animal Place is caring for the overwhelming majority of the survivors; you can follow their progress on their website and tumblog. Of course, if you don’t need anything or would rather all your funds go toward the hen rescue, you can always make a direct donation: here for Animal Place and there for Harvest Home. Your gift can literally help to save a life – such as that of this rescued hen, shown here taking her very first steps outside after a life spent confined to a battery cage. If you happen to live nearby, Animal Place is also in need of volunteers as well as adoptive homes for some of the birds. Not in a position to do either? Spread the word! * Photos by Animal Place’s Marji Beach. I intentionally didn’t include any of the more traumatic ones – and they are super-traumatic, to the point that I can’t so much as think about them without needing to cry-vomit – ’cause I didn’t want to bum y’all out. But you can view all of Marji’s photos on flickr: Turlock Hen Rescue Set. Posted: 02/29/12 at 6:19 pm. Filed under: Uncategorized. Photos courtesy of Spay & Neuter Kansas City. Spay & Neuter Kansas City is an awesome group that provides low-cost spay & neuter and vaccination services in the KC area. The also provide education and outreach services, run low-cost dog training classes, maintain a “pet” food pantry, and help find homes for animals in need. Currently they’re in need of in-kind donations (such as dog and cat food, hay, litter boxes, dog houses, and cleaning products), as well as donations of money (or perhaps services?) to repair their outreach truck. Every little bit helps! You should also know that Wayside Waifs is holding a special “All I Want For Christmas Is YOU!” Adoption Event this Saturday, December 3rd (that’s tomorrow, folks!) from 10AM to 6PM. Stop by and meet the 300+ plus nonhumans who need a kind-hearted soul (that’s you) to bring them in from the cold this holiday season. All adoptions are just $25! Second chances, is there any gift greater? Posted: 12/2/11 at 12:01 pm. Filed under: Find-a-Friend Friday. Photos courtesy of Wayside Waifs. Wayside Waifs – like so many other shelters across the country – is currently filled with dozens of awesome cats and kittens in need of homes (160 at least count!). Newborns like the adorably named Darth Vader, Princess Leia, Han Solo and Chewbacca (siblings, I’m guessing? ), or Daffy and Daisy Duck; distinguished older cats including Lola and Morgan; longer-term residents, like October; and special “special needs” felines, such as Stan the Man here! Stan’s requirements aren’t all that extraordinary, actually; the little guy is just short one eye and needs you to look past that, mkay? Don’t think of him as different – at least not in a negative way; think of him as unique! The most adorable pirate you’ve ever seen! Stan the Man here! Just like Stan Musial I’m an all star, widely considered to be one of the all time greatest snugglers of all time. I’ve compiled 3,630 purrs (the most in a career spent with only one team) 475 home runs for watching sporting events with my family, and was named the Most Valuable Pussycat by all my roommates, I’d still be living there but the landlord in our new place allows only two pets and the dogs got to stay. I lived with only one family my whole life and I’m sad I had to go, but I just know I’ll find another family just as terrific. If you’re looking for a Hall of Fame Feline Friend, I’m your man! You may have noticed I have only one eye. Kind of makes me look kind of rakish, like a pirate, I’m thinking Johnny Depp. Boy, is he hot! I hear the ladies really go for him. They go for me too! I have lots of fans here in the staff and volunteers at Wayside. I’m a people person and love to hang out with you, but do okay with small dogs. I lived with two small dogs for many years but I’m not good with big dogs as I’d been attacked by them in my past. Please don’t take me if you have a big dog. I’m very afraid. I shouldn’t go outside. I can’t defend myself well because I can’t see what’s coming on one side. Inside I do great! I love to climb and my favorite place to perch is high up on the furniture. I respond well to my name, so please don’t change it when we go home. I’ve lost my people, my home and my dog brothers, so my name is all I have left that’s familiar and comfortable. I need something to hold on to, please. I’ve lived with a family the last 8 years so I’m having a little trouble adjusting to shelter life. I’m a bit shy and not as outgoing and friendly as I’d be with people I know and love. When we go home, I might go hide under a bed or in a closet until I feel comfortable joining the family. I’m affectionate and want to be buddies, but I’ll need a bit of time to adjust. My family says I enjoy running water so if I can please have a kitty fountain or stick my head under the sink when you’re brushing your teeth or doing dishes sometimes, I’d like that. I have great hygiene habits and never have a litter box issue if you keep it clean for me. I eat dry food but shouldn’t have only dry food as it’s hard on my tummy. I need some wet food too. Thank you so much for honoring my requests. And don’t forget in these tough economic times, I’m a bargain, just $25 for a lifetime of friendship and affection. Such a deal I have for you! I’m looking forward to joining your team and being your MVP. I’ll be at batting practice faithfully learning to swat my toy mice way, way out there… going going gone! Holy cow! See you around the ball park. Lucky for them – and you! – Wayside is holding a half-price adoption event this weekend! Adopt a boo (or two! – *cough* littermates *cough*) for half the regular price – or just stop by for the craft show, silent auction and raffle! * Not literally! We have about as many boos as we can handle, I’m afraid! Posted: 10/21/11 at 11:10 am. Filed under: Find-a-Friend Friday. If you’d like to play along too, here are some links to get you started. The deadline to sign up and be featured in the official VeganMoFo blogroll is September 28, so get to it! And now, let the post hoarding commence. Oh, but first: the first batch of Mags & Finnick photos are up! Seven dogs, only one photo (so far!) in which they all appear. And of course I’m not in it, pfffft. No justice. More to come soon – but for the time being, I have my hands full with SIX RAT TERRIERS AND AN ORNERY OLD DACHSHUND! Oh, and now twenty mofo posts too. Seriously what was I thinking! Plus I think I’m coming down with a cold. Oh, the horrors. Posted: 09/19/11 at 11:00 am. Filed under: Food & Recipes. This World Go Vegan Week, vegan pizza will take over the world! What follows is the most delicious action alert I’ve ever received from In Defense of Animals. In honor of World Go Vegan Week, IDA and Daiya want to team up with you (yeah, you!) to spread the cheesy vegan pizza love! Help persuade your local pizzeria to offer a vegan pie for World Go Vegan Week … and beyond! (Vegan Pizza Day is just a few months later, yo!) All the vegan pizza will be ours! Muahahaha! By the by, Vegan Pizza Takes Over the World? NEEDS TO BE A COOKBOOK LIKE NOW! Make it happen, crafty chef peoples! Vegan Pizza Takes Over the World! World Go Vegan Week (October 24 – 31) is a celebration of compassion, and a time to take action for animals, the environment, world hunger, and everyone’s well-being. This year is going to be extra special … and extra cheesy! We want to help make it even easier to be vegan, and what better way than being able to order a quick and easy pizza – with delicious vegan Daiya cheese. You can help with just a few minutes of your time by reaching out to your local pizzeria and asking them to offer a vegan pizza. Our goal is to make eating vegan simple, fun, and accessible to every community. One of the best aspects of restaurant outreach is that a single person can make a direct and lasting difference for animals. Please contact your local pizza shop and ask them to offer a vegan pizza for the week of World Go Vegan Week. Our partners at Daiya cheese have offered to provide a free sample of Daiya cheese for the pizza shop to try. Daiya cheese melts, stretches, and tastes just like traditional dairy-based cheese. We will provide you with a letter and tips on how to approach the pizzerias. Remember, all it takes is one person to make a major difference in changing everyday restaurants into vegan-friendly havens. To be part of spreading the vegan pizza love in your community, contact Hope Bohanec: hope@idausa.org 415-448-0058 or 707-540-1760. Vegan pizza outreach not your cup of tea? There are many other ways to celebrate with us! Click here for other ideas to promote World Go Vegan Week. New to veganism? Click here to order a Vegan Starter Kit. New Contest – Win A Month’s Supply Of Daiya Vegan Cheese! You could win a month’s supply of Daiya vegan cheese simply by participating in our exciting campaign to make vegan eating fun and accessible for everyone. 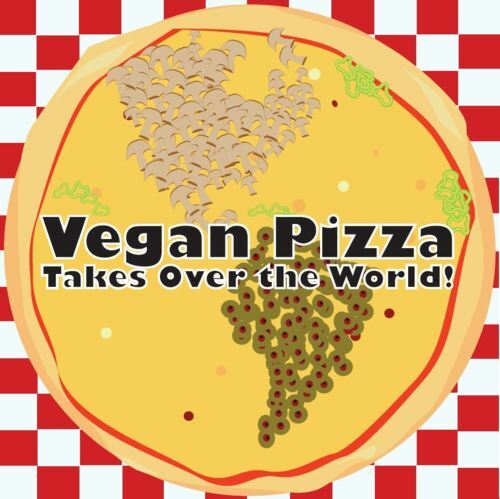 Our Vegan Pizza Takes Over the World campaign is really taking off! Volunteers are approaching dozens of pizza parlors around the U.S. and Canada, asking them to offer a vegan pizza featuring Daiya cheese for World Go Vegan Week, October 24 – 31. Just get a restaurant to offer a vegan pizza for that week and you will be entered into our drawing for a month’s supply of Daiya vegan cheese! Soy-free and gluten-free Daiya cheese melts, stretches, and tastes just like traditional dairy-based cheese. Yum! Daiya will also send free samples for pizza shops to try. We’ll provide you with a letter and tips on how to approach the pizzerias. One person can make a major difference changing everyday restaurants into vegan-friendly havens. To help spread the vegan pizza love in your community, and get your name in the drawing, contact Hope Bohanec: hope@idausa.org 415-448-0058 or 707-540-1760. We will announce the winner in an upcoming IDA eNews. Vegan pizza outreach not your cup of tea? Click here for other ideas to promote World Go Vegan Week. Posted: 08/29/11 at 6:09 pm. Filed under: Food & Recipes.